The buying process has changed over the years and it can be hard for businesses to adapt. People today engage in more internet searches and social media to learn more about a product or service. In fact, 82% of people use more sources to research and evaluate products and services, and they are spending more time in the research phase itself. This makes it difficult to understand the steps your customers take leading up to a purchase. One of the most important parts of the sales process is understanding how to show the right thing to the right person at the right time. You have to show your potential customers exactly what they're looking for at the exact time they want it. In this blog, we will go over what the buyers journey is and explain how each stage of this journey works to help you have more happy customers and grow your business. 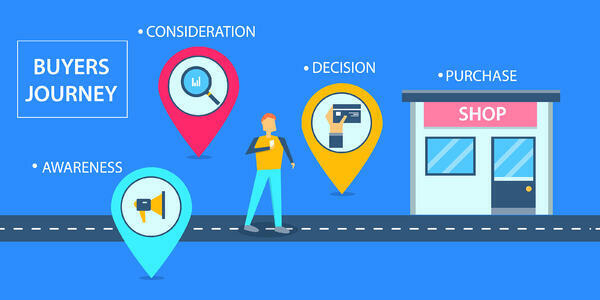 What is the buyers journey? The buyers journey is the process buyers go through to become aware of, evaluate and purchase a new product or service. Awareness Stage: Buyer realizes they have a problem. Consideration Stage: Buyer defines problem & researches options to solve it. Decision Stage: Buyer chooses a solution. In the awareness stage, buyers are identifying what their challenge is. When a person realizes they have a problem, they will usually go to Google and type in their problem to research it and to learn about the potential ways they can solve it. 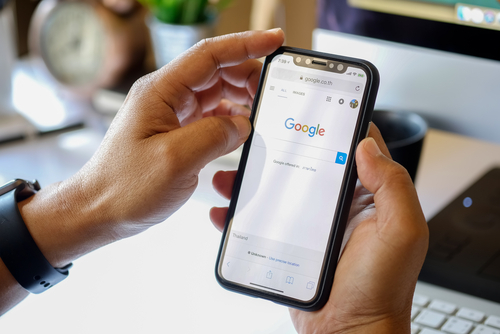 Research has shown that 71% of B2B researchers start with a generic search rather than searching for a particular company and do approximately 12 searches before engaging with a particular business. For this stage, it is important that people know who you are. Here, you want to show your potential customers informative content that could be the solution to their problems, wants and needs. You want to make sure that people can find your business, product or service. When building your content, make sure to use content that will spark emotion and promote brand awareness. Content amplification is super important here - the more time spent on content amplification increases the amount of reach, engagement and ROI your business receives. The main takeaway here is to consistently create new content. If you are doing something cool, record it and make a promotional video out of it. Write new blogs, create new videos and content and push it in front of your ideal audience. During the consideration stage, buyers have clearly outlined and defined their goals and challenges and are looking for the best potential buying options. Content should be focused on the buyer’s pain points — not your product or brand and especially not what you think they need. If you ask the right questions and pay attention to their buying patterns, your audience will tell you what they want. During this stage, it is so important to make sure you are showing the right thing to the right person at the right time. If they are looking for more resources, you could send them a free eBook or guide to help convince them that your product or service is the solution. You want to offer specific content and key features based on what their interests are and what they are searching for. In other words, you want to become a resource, become an authoritative figure in your niche, and seem like you are their best solution. At this point, the buyer is ready to make a purchase. After you have mapped out your buyers journey you can build remarketing audiences. You can build audiences based on their specific interests, what they're searching for (or a combo of the two) to ensure they complete the buying process and become a loyal customer. You want to send your audience(s) exclusive offers, promotions and fast-action bonuses that create a sense of URGENCY. Provide reassurance that they're making the right decision by choosing you. This is also a great place to display customer testimonials. Testimonials have been proven to dramatically increase credibility, lead generation and customer retention by simply using the positive behaviors of existing clients. The main objective is to create more content and opportunities to solve their problems on as many platforms as you can to help guide them through the sales journey. Once you understand how to show the right thing to the right person at the right time, your business and customers will began to flourish. If you would like more of our help on the buyers journey and increasing your impact then I encourage you to check out DM Impact! It's our mentor and training community where you will work closely with our team to grow your audience using Digital Marketing!